How hard is it to make a decent teen movie? I’m late to the party on The Edge Of Seventeen, having only caught up with Kelly Fremon Craig’s very likable debut feature over this long and balmy Independence Day weekend. And yes, I’m on the same page as just about everyone else on this movie: It’s what every formulaic high school relationship-comedy-drama with a smart-aleck protagonist would look like in a much, much better world. The plot is nothing new—something about a sardonic high-school junior (the reliably sharp Hailee Steinfeld) being thrown for a loop when her best and only friend (Haley Lu Richardson) begins dating her older popular brother (Blake Jenner), which leads her to pester a droll history teacher (Woody Harrelson, in one of his finest recent performances), push away her widowed mom (Kyra Sedgwick), etc., etc. The setting is a middle-to-upper-middle-class, filmed-in-Canada suburban nowhere. No one in the cast looks all that teenage—not even Steinfeld, who was actually still in her teens at the time of filming. There are a lot of movies like this. But why are so few of them this smart? Is it really that challenging to make a good movie for and about American teenagers? Am I settling for low standards when I find myself appreciating a detail like, say, the fact that Steinfeld’s character, Nadine, wears the same thrift-store jacket in almost every scene? Of course, whether we’re talking Hollywood or the indie farm leagues, realistic coming-of-age movies are practically non-existent in America, as any kind of true-to-life depiction of teens or teenage relationships would involve all kinds of taboos that make Americans squeamish, not to mention all the drama that would have to unfold entirely via tiny screens and text. (This is true going back even to the millennials of my generation; if anyone actually made a realistic movie about being a teen in the early-to-mid 2000s, half of the plot would be told through the dings and squeaky-door sound effects of AOL Instant Messenger.) The truth is that American teen movies are a highly artificial and codified genre that we’ve sort of come to accept as a stylized depiction of something foundational. They’re as phony and archetypal as old Westerns. 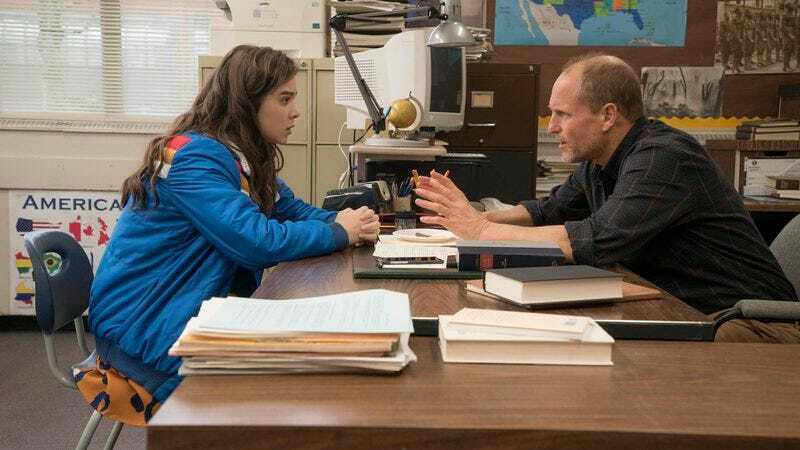 The Edge Of Seventeen works entirely within these well-established tropes, though it handles them fluidly and organically, mostly because it’s better written, directed, and acted than most entries in the genre. But there is also a fundamental difference in attitude that I think applies to all sorts of other film narratives: the difference between ends and means, literal readings and metaphors, and the business of hacking out a story and considering what it might mean. I don’t know many people who gave two shits about prom, homecoming, or any other school dances, to cite one popular cliché of teen movies. Perhaps that’s just the company I keep. Any movie that takes school dances literally is bogus, but the moment you embrace them as a shared, stylized cultural metaphor or as a fleeting, claustrophobic, lyrical, expressionist space for pent-up or confused feelings—as in Brian De Palma’s Carrie, Sofia Coppola’s The Virgin Suicides, or, heck, even Back To The Future—you’re getting somewhere. Everyone I know who has seen I Am Not Your Guru has become obsessed with it. It’s designed to be cathartic, an experience that stays with you. The 2016 documentary about self-help guru—or, should we say, “life coach”—Tony Robbins, directed by Joe Berlinger of Brother’s Keeper and the Paradise Lost trilogy, follows Robbins as he leads his six-day, $5,000 “Date With Destiny” seminar. On its surface, it’s a strangely absorbing film. There is, of course, Robbins himself, a massive and charismatic figure, prowling the stage clapping like a bear and howling profane exhortations to the audience. Then there are the so-called “interventions,” which play out in prolonged sections of the film, during which Robbins works, with surprising probity and speed, to break down a given audience member’s insecurities and life obstacles. Robbins generally steers them toward big revelations about their parents and traditional gender roles, but they’re swept along by the certainty of his delivery. He’s able to pick out small cues in their body language that help build his case. Without exception, he is proven correct. It’s hard not to root for him in some of these moments. Some of the attendees are deeply hurting, suicidal people—one sexual abuse survivor, who escaped a cult, has a particularly harrowing backstory—and afterward they seem unburdened thanks to their session with him. Others—like the woman forced to break up with her boyfriend on speakerphone in front of the entire audience—seem to get a little less out of the exchange. But watching people throw caution to the wind because a hulking billionaire celebrity is pressuring them in front of thousands of people is the sort of massive social phenomenon full of specific, human stories that makes for an absorbing documentary. It’s an irreligious cult, and a distinctly American phenomenon. There’s a whole rabbit hole of this stuff online. But the film is absorbing on a deeper level, too, because Berlinger buys into it all. In fact, at the end of the film, through soaring music, flashing lights, and a carefully layered montage, he strives to create in the viewer the sort of transcendent moment that Date With Destiny attendees pay so handsomely to enjoy. Anyone who has spent time at a mega-church knows the anthemic music and production values of these moments, the carefully orchestrated pyrotechnics engineered to overwhelm rooms full of people at the same time. The most interesting twist comes in the film’s epilogue, as person after person who we had gotten to know in the film reveal their new life plans after the Date With Destiny: They’re all starting their own life coach business. What Tony unlocks in them is an aspiration to be like Tony. That the film totally fails to interrogate this cycle only adds to its mysterious allure, a high-gloss advertisement for a very expensive sort of happiness.